Looks a bit like the pics of aiptasia that I've seen, except the ones in my tank are shorter and stumpier. Can someone confirm, or otherwise ID these guys? Fortunately, these guys are on a piece of LR right on top of my scape, so should be fairly easy to take out - assuming they aren't anywhere else! Looks like an encrusting gorgonian to me. Yeah, aiptasia have smooth tentacles and don't have a 'mat' like that. First of, thank you for the quick responses! Secondly, phew! I'm so glag it's not the dreaded aiptasia. I did a quick search since "encrusting gorgonian" meant nothing to me :-), and I take it these are sea fans? I have nothing but zoas and feather dusters in my 90 gallon, so need as much help as I can get. Anything to watch out for with these guys? Will they continue to spread? How big could they get? Location: Sitting on a park bench...eyeing college girls with bad intent. 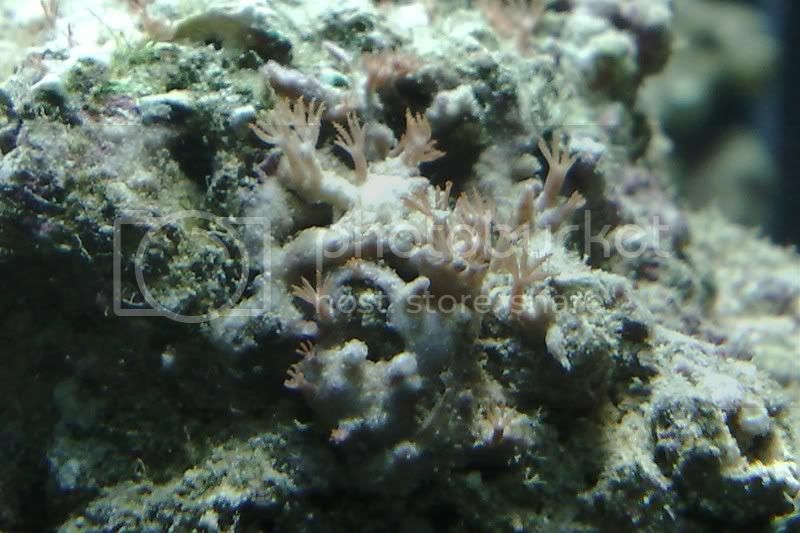 Looks like star polyps or xenia...But definitely not aiptasia. all generalizations are false...including this one. I'm betting its xenia, I've seen it grow like that before. no Aiptasia and no Xenia.